Hey Readers. TGIF! Today’s Fantasy is one of the most famous homes in the country ( in the fields of Architecture, Architectural History and Historic Preservation), so I thought it might be a change of pace to share a relatively well-known house with you. 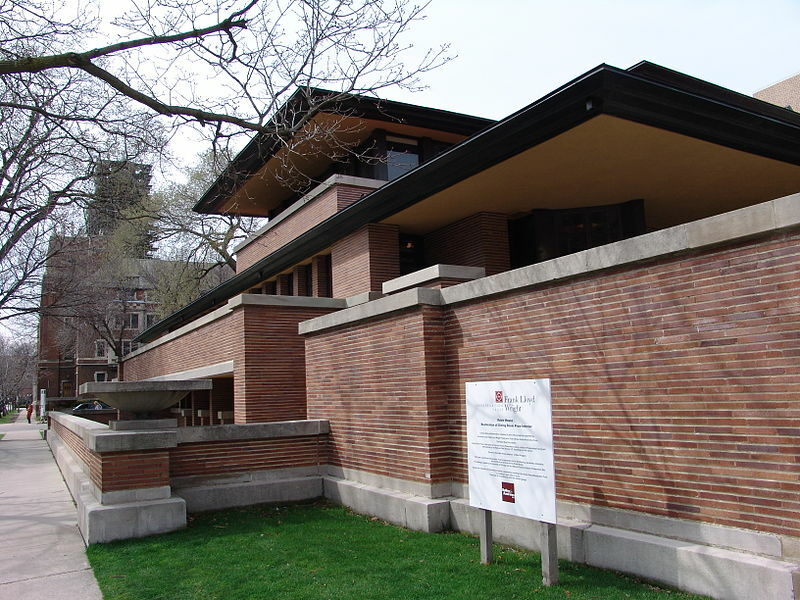 Let’s take a look at Frank Lloyd Wright’s Robie House. 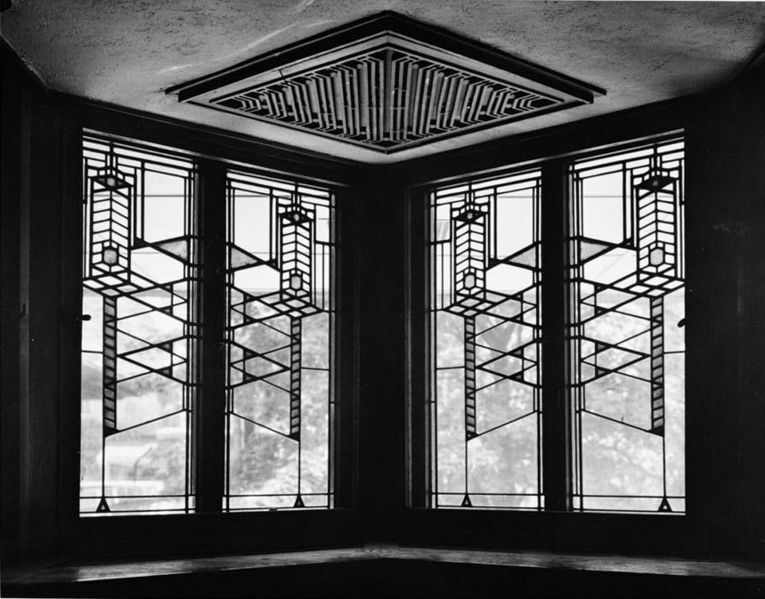 The Robie House is the quintessential example of the Prairie Style, and probably the best representative of the style that Frank Lloyd Wright created in the early 1900s. The Prairie Style is characterized by an open, spacious interior layout, long horizontal lines like the landscape of the prairie, low pitched hipped roofs and long banks of windows. The goal of a Prairie building (like any FLW building) is to add to its natural setting rather than dominating it, with an emphasis on craftsmanship. 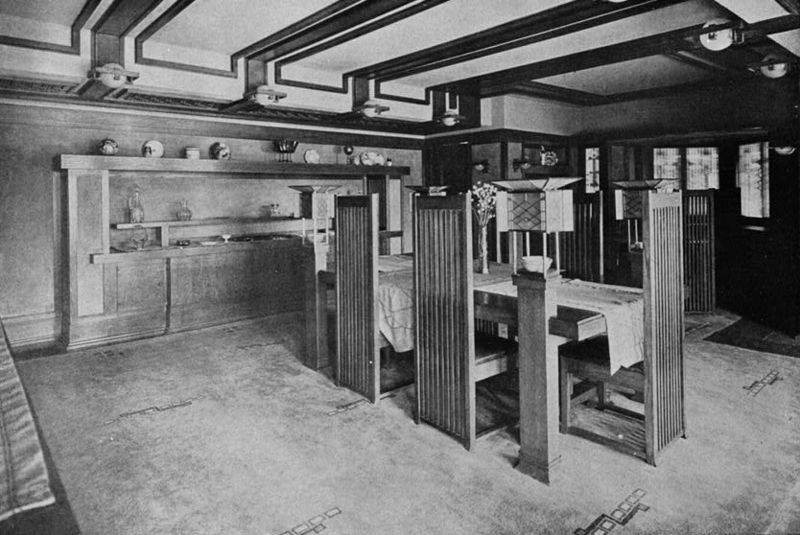 Built between 1908 and 1910, the Robie house was built for Frederick C. Robie, the 28-year-old Manager of an excelsior supply company. Shortly after Robie and his family moved in, they had to sell the house due to financial trouble. The house was sold and re-sold several times in the following years, but Wright furnishings stayed with the house when it was sold, fortunately. Eventually, the Chicago Theological Seminary bought the house with plans to expand their campus. It narrowly escaped demolition twice at the hands of the Seminary, the final time in 1957, when several vocal advocates for the home, including Wright himself who was 90 years old by then, turned out to protest the demolition. The building was ultimately purchased by a friend of Wright in 1958, who donated it to the University of Chicago. 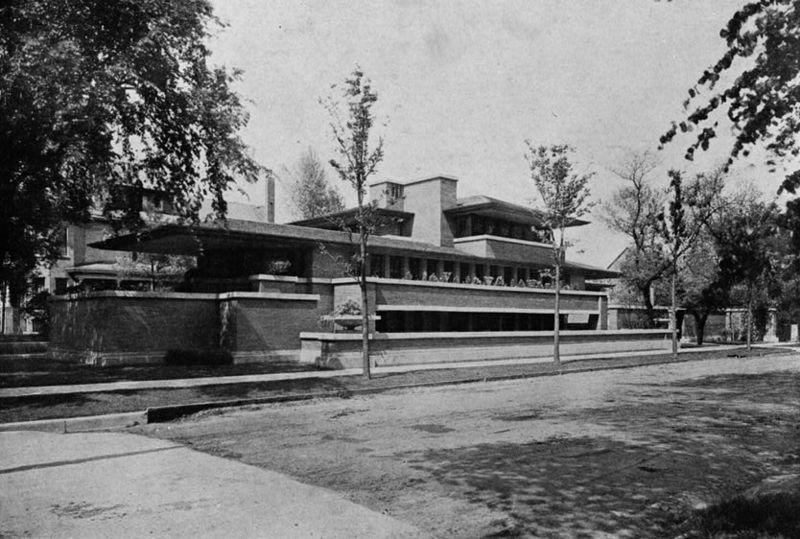 The University eventually turned over operation of the Robie House to the Frank Lloyd Wright Preservation Trust (FLWPT). The FLWPT undertook a massive restoration that costs over 10 million dollars to bring the home back to its original understated grace and beauty. They continue to give tours of the house and grounds weekly, Thursday-Monday. I hope you enjoyed your architectural history lesson for the day. Have a great weekend. Happy New Year Readers! 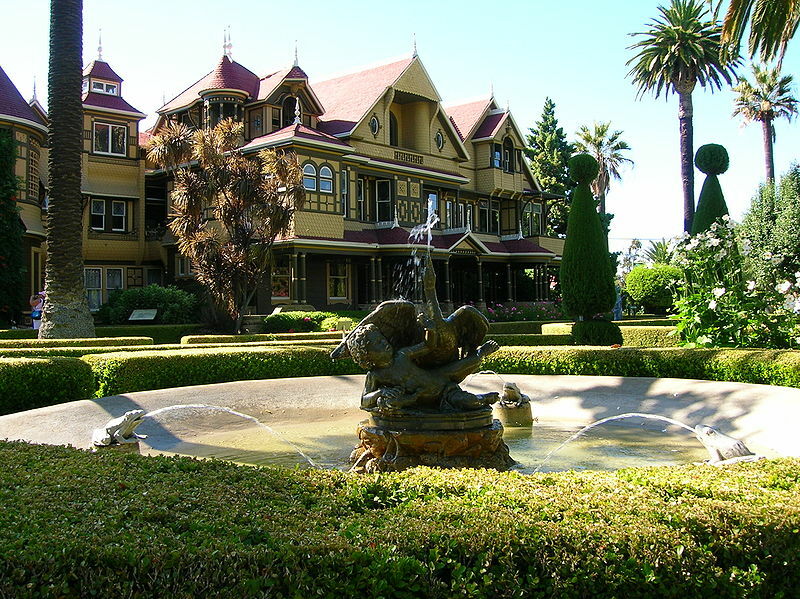 Today’s Fantasy is about The Winchester Mystery House and new beginnings. It’s also kinda creepy, but that’s the way I roll so I hope you enjoy it. The Winchester Mystery House (a huge Queen Anne Mansion in San Jose, California) is actually not as much of a mystery as it is the sad story of a grieving woman driven insane by an unscrupulous “spiritualist”, who preyed upon her pain and fears. It still makes for an interesting little architectural oddity, as well as presenting a great muse for Stephen King as the basis for the story of Rose Red ( a vampiric house that kept building itself even after its owner died by feeding on psychic energy). Being a Mainer, I love me my Master of Horror! Now onto some background! Sarah Winchester was the wife of William W. Winchester (ya know, the one that made all the guns). In the early years of her life, Sarah was known as the “Belle of Hartford”, but after she married her life took a sad turn. Sarah gave birth to a daughter who died shortly after she was born, then her husband died of tuberculosis. Both deaths took a significant toll on Sarah, so her friends encouraged her to seek guidance from a medium and spiritualist (spiritualism was all the rage in the late 1800s, after all). So, Sarah went to a medium in Boston and was told that all of the misfortunes in her life were caused by spirits of the people who had died at the hands of men who wielded Winchester guns (naturally, instead of the easily explained high infant mortality rate of the time and the fact the there wasn’t a cure for tuberculosis yet). The medium told Sarah that the Winchester curse might be after her next! However, there was an alternative to her demise…. If she went west to the setting sun and built a house for the vengeful spirits, then she would live a long life in peace. That’s exactly what she did without delay. Sarah moved to the Santa Clara Valley and purchased an unfinished farm house and began to make additions. And more and more and more additions. 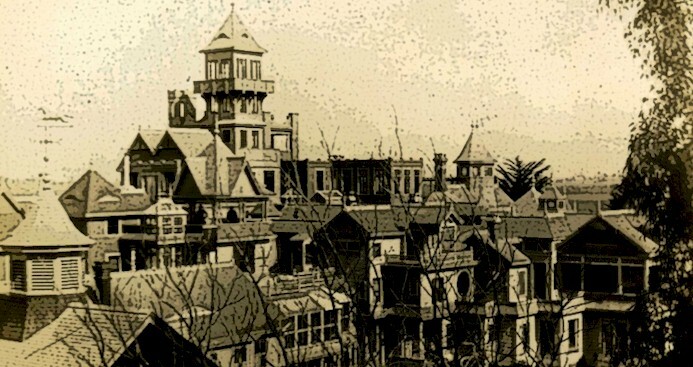 She continued building for the next 38 years without ceasing (that’s what a 20 million dollar inheritance would get you in the Victorian era), and she left behind what is know as the Winchester Mystery House today. 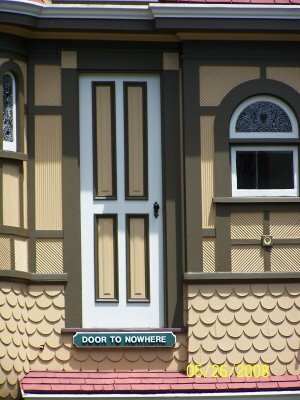 Why is it called the “Mystery House” you might ask? Well, other than the vast size of the mansion… which the New Englander in me cringes at, but it’s in California so heating it can’t be THAT bad right? 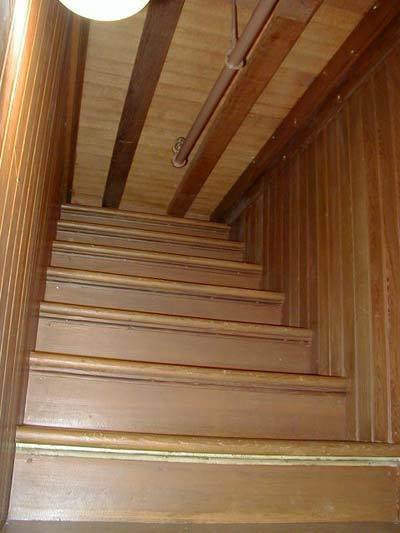 The house also has some peculiar spirit confounding features such as staircases that end in walls and doors and windows that lead to nothing (except possibly to your death, if you weren’t careful). And if all those crazy architectural features weren’t enough, it is also said that Sarah slept in a different room every night just to further confound the spirits, lest one try to off her in her sleep. This first photo gives you a good idea of what the house looks like today. This next image gives you a sense of the overall scale of the house. Watch that first step, it’s a killer! Hope you enjoyed Mrs. Winchesters “new beginning” and this bizarre tour of the Mystery house! For more information check out the Mystery House website. Have a good weekend!